Every now and then I check various stats on this blog, especially the search terms that bring people here because those are usually worth a laugh. 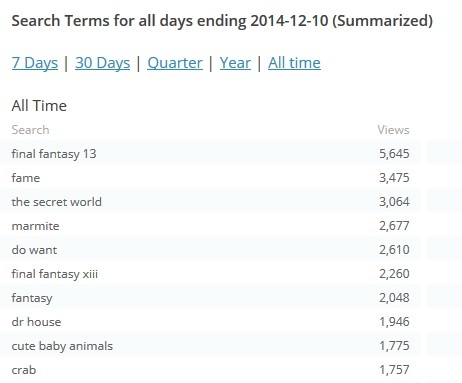 Today, I’m puzzled (among other things) to note that of the top 10 search terms of all time, only 3 are related to games (two, technically, since two of those are variants on the number ’13’); and the top term by far is for a game I only ever wrote ONE post about. A short one at that, linking to an actual post on Gamasutra. At one point, Google image search would ping your blog and register as a view when people click on images it returned. For a while “mouse” “white mouse” and “mouse on scooter” were very popular search terms because of a single image I posted. About two years back Google changed how image search worked and you no longer get as much traffic that way, and then they hid search terms so that logged in user terms are confidential. But I am betting, over time, that kitten picture you posted (which I found with a quick Google search) was probably driving at least the “cute baby animals” result. I’ve posted a number of kitten pix – as well as Dr. House pix and a few others, so them showing up in the search aren’t surprising (and yeah, I remember the ‘views’ from images back then). Those don’t faze me. It’s that FF13 post I find super weird.